Carla Olson Gade here to tell you about Ship Figureheads. In my novella, "Carving a Future," that has been re-released this month in The American Dream Romance Collection, the hero of the story is a journeyman ship's figurehead carver in mid-18th century Connecticut. I began my in-person research of ship figureheads in Colonial Williamsburg, Virginia, and ended up in Mystic Seaport, Connecticut, where I had the privilege of viewing some amazing carvings and visiting a figurehead carving shop. Much of my research was also done online where I studied the methods of some woodcarvers who are carrying on the tradition of this exceptional craft. 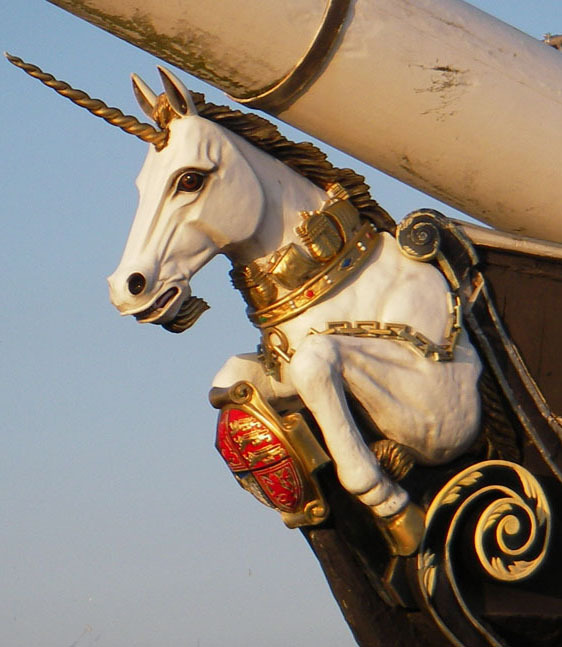 Ship figureheads, sometimes referred to as Neptune's wooden angels, are an ornately carved wooden sculptures attached to the bowsprit (the forward extending spar) of a ship. Many a past ship carver's artistic expression has been memorialized in the extant figureheads that once graced a ship's prow. A figurehead helped identify a ship and also helped non-literate people know the ship's name. In its day, a ship without a figurehead was akin to a ship without a sail. But figureheads were also wrapped up in superstition. They were believed to embody the spirit of a ship and were originally thought to placate the gods of the sea and ensure a safe voyage of the sailors. HMS Unicorn built in 1824, shipwrecked. The custom of figureheads attached to the bowsprit of a ship stems from ancient times and often represented a deity, mythological, or supernatural belief. The Phoenician horse, which symbolized speed, was one of the earliest uses of a wooden statue attached to a maritime vessel. Egyptians painted eyes and carved holy birds on the prow of their ships. The Greek boar's head was used to represented acute vision and ferocity. The Roman centurion portrayed valor in battle. Norse dragons and snakes characterized fierceness. All other manner of creatures were used as sentinels on ships throughout Northern Europe. By the 16th century, figureheads were meant to embody of the might and spirit of the galleons, sometimes in tandem with the ship's name. British Admiralty often featured a lion on their frigates. All sorts of characters were carved into figureheads: animals, birds and reptiles, nobility, warriors, cultural/classical/religious/mythological icons, mermaids, and most often of beautiful women — sometimes the effigy of the ship's captain or owner's wife or daughter. During the 18th century the size of figureheads were generally reduced, due to the weight of the massive wood carvings, which adversely affected the efficiency of the sailing vessels. This was especially important in times of war, as cost was also a consideration. Mid-19th century clipper ships still used the smaller, lighter version of figureheads but by the end of the century the clipper stem was no longer built on warships and merchant ships. The development of non-wooden vessels prohibited the attachment of a figurehead altogether. Thus, the figurehead became an icon of the past, substituted with a billet-head (a carved ornamental scroll) or a ship's badge (that may feature a coat of arms) on a war ship. Figureheads at Mystic Seaport Museum, Connecticut. To sail in a ship without a figurehead was considered highly dangerous. Sailors believed that a ship needed to find its own way, and could only do this if it had eyes. 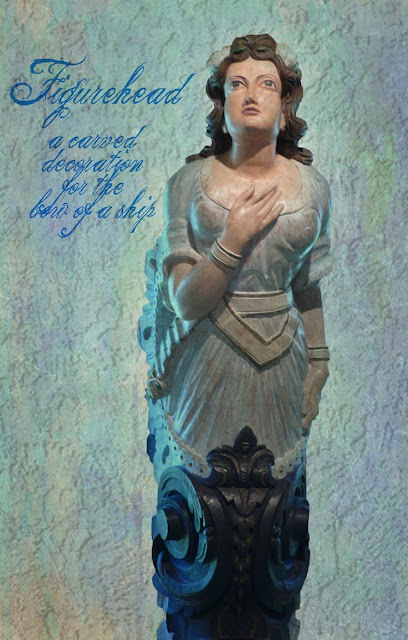 A figurehead was thought to be the embodiment of the ship's soul. To ward off evil spirits as the ship bounded through the ocean. To protect the crew and passengers from traveling maladies. A bare-breasted woman figurehead was thought to calm an angry sea by enticing it with its beauty. If a figurehead was painted black it was considered bad luck. In Germany, Belgium, and Holland, it was believed that fairy type spirits dwelt in the figureheads. Some sailors believed that if a vessel went down without a figurehead it condemned the sailor's soul to haunt the sea for all eternity. Carving a Future - Connecticut, 1753: Ship figurehead carver Nathaniel Ingersoll has apprenticed for many years under his Uncle Phineas and hopes to become a master ship carver in his own right. 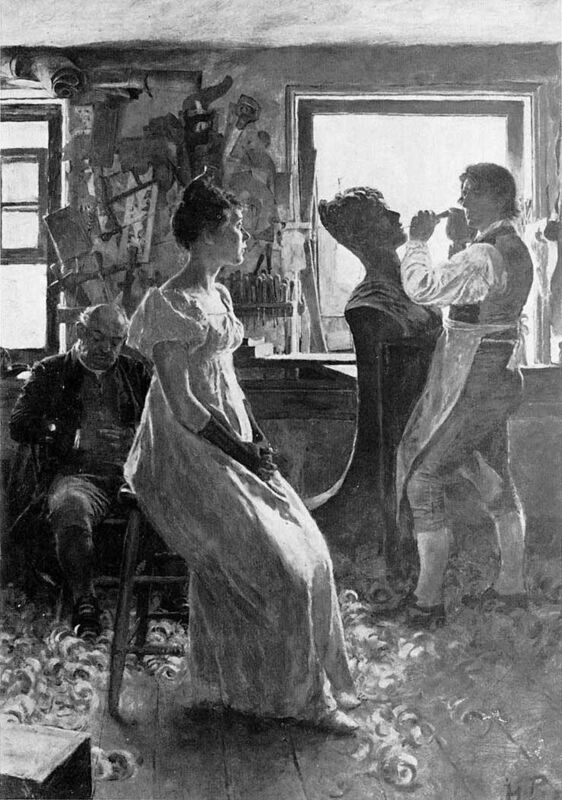 Constance Starling was spirited away from England to the Connecticut coast as an indentured servant, arriving too ill for anyone to accept her. When Nathaniel takes pity on her, he purchases her contract. Has he jeopardized the future he has worked so hard to achieve for the welfare of a weakly servant? Native New Englander Carla Olson Gade writes from her Victorian home in Central Maine. 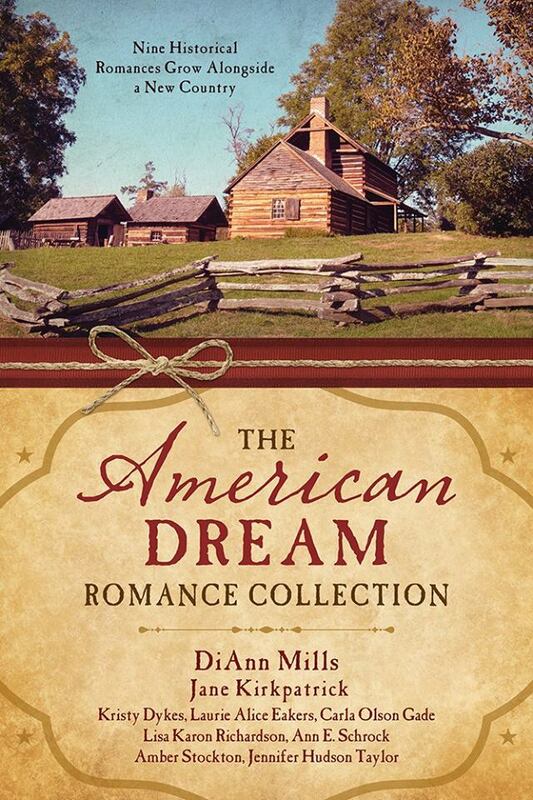 With eight books in print, she enjoys bringing her tales to life with historically authentic settings and characters. An avid reader, amateur genealogist, photographer, and house plan hobbyist, Carla's great love (next to her family) is historical research. Though you might find her tromping around an abandoned homestead, an old fort, or interviewing a docent at an historical museum, it's easier to connect with her online at carlagade.com and on facebook. Hey Carla! Fascinating post! I've always been intrigued by ship figureheads. These photos are amazing! Aren't they awesome? I admire such talent. They are only a handful of figureheads left today. Very interesting topic! I had always assumed the figureheads were made by whoever made the ship, but it was a craft in and of itself. 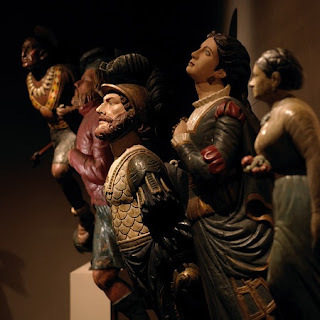 I bet it would be cool to visit that museum in Connecticut and see the old figureheads. It's really a fascinating trade. I really enjoyed researching it and seeing some of the beautiful figureheads in person. Interesting topic thanks for the info. I never knew this. Learning new things even at 51 ! Book looks awesome! Thank you, Linda! We are never too old to learn...at least I hope not as I have a few years on you!